Parcels shipping services from Canada to Europe. * depending on the country of destination; please refer to the following link for monthly pick-off dates here. Delivery to any address in Romania. Delivery time is 4 weeks starting the date the container leaves the port; for details about delivery standards see here. Minimum weight for one package to Romania is 13kg/30 lbs. (NOTE: We also accept smaller parcels; however, they will be charged at the same weight, i.e. 13kg/30lbs). Please check the rates here. delivery time is up to 7 days; for details about delivery standards see here. No minimal fees. Please check the rates here. Expedited is a bi-monthly air shipping service offered at a special rate, created for sending parcels and other objects of any sizes to Romania. To obtain an exact and updated quote, Please check the rates here. Economy is a bi-monthly air shipping services created for sending parcels and other objects of any sizes to Romania, the Republic of Moldova, Hungary, Bulgaria, and most European Union countries. To obtain an exact and updated quote, please check the rates here. delivery times to Romania are 4 weeks starting the date the container leaves the Port of Montreal; for other countries, delivery times vary on the country of destination and are approximately 4-5 weeks;for details about delivery standards see here. Minimum fees for shipping by package depend on the country of destination. Please check the rates here. 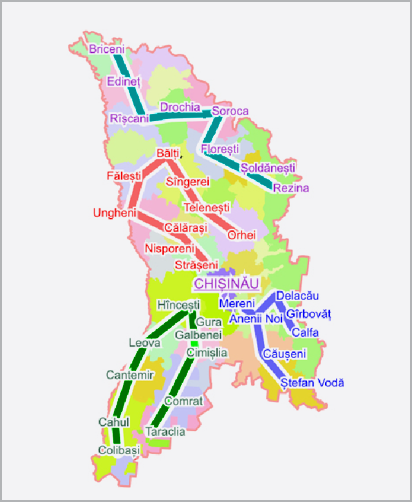 We ship to any address in the Republic of Moldova through our partner as per our schedule. Delivery time is 4-5 weeks starting the date the container leaves the port; for details about delivery standards see here. Minimum weight for one package to Moldavia is 18kg/40 lbs. (NOTE: We also accept smaller parcels; however, they will be charged at the same weight, i.e. 18kg/40lbs). Please check the rates here. Delivery to any address in Hungary. Delivery time is 4-5 weeks starting the date the container leaves the Port of Montreal; for details about delivery standards see here. Minimum weight for one package to Hungary is 20 kg/44 lbs. (NOTE: We also accept smaller parcels; however, they will be charged at the same weight, i.e. 20 kg/44 lbs). Please check the rates here. We can provide hard fiberboard boxes, free of charge. Minimum weight for one package is 15 kg/33 lbs. (NOTE: We also accept smaller parcels; however, they will be charged at the same weight, i.e. 15 kg/33 lbs). Please check the rates here. Delivery to any address in: Bulgaria, Czech Republic, Slovakia, Slovenia, Austria, Belgium, Croatia, Germany, Italy, Luxemboug, Netherlands, Poland, Denmark, France, Ireland, Spain,United Kingdom, Cyprus, Estonia, Finland, Greece, Latvia, Lithuania, Sweden. Delivery time is 4-5 weeks starting the date the container leaves the Port of Montreal; for details about delivery standards see here. Please check the rates here. When you drop off your parcel, you agree to the "Transportation Terms and Conditions" which are non negotiable. We reserve the right to modify the content of our website and our fees at any time, without prior notice.